Ladies in Black film review | Daily Review: Film, stage and music reviews, interviews and more. Bruce Beresford has a repertoire of films that stretch from broad and iconic comedies (The Adventures of Barry McKenzie) to brilliant and nuanced relationship studies (Tender Mercies and the Oscar-winning Driving Miss Daisy among them). Despite his extraordinary track-record, it has taken him 25 years to pull together the financing to adapt Australian writer-expat, Madeleine St John’s 1993 literary masterpiece, Women in Black – despite being her friend until her death in 2006 and subsequently, her literary executor. It is worth the wait. This tale of a young girl’s coming of age among the staff of Goode’s, a Sydney department store in the 1950s, is an upbeat comedy of manners which astutely records the conservatism and parochialism of Australian society and its own coming of age as it absorbs the wider world through the arrival of post-war European “refos”. These “new Australians” brought a cultural sophistication that was simultaneously threatening and seductive, with new food, music, and literature. Their response to the new homeland was equally conflicted: they were, in the main, passionately grateful for the safety and opportunity and bemused (or horrified) by its cultural naivete and self-absorption. Although the complicated and reclusive St John wrote the book from the other side of the world, the distance sharpened her understanding of what she had escaped. One suspects that its protagonist, Lisa, draws at least a little on St John’s own ambivalence towards Australia and her determination to flee. Her accurate portrait of a country on the edge of its future could only be written by a writer who had felt it. It seems equally clear that the power and authenticity of the film could only have been captured by a film-maker who had lived it. The enchanting Angourie Rice gives a perky, spirited performance as Lisa – and this is really her film. Both St John’s novel and Beresford’s adaptation capture this mutual seduction of locals and foreigners as Lisa, a bright young school leaver intent on going to university to her father’s dismay, encounters Magda, the European manageress of the imported cocktail frocks department. Recognising Lisa’s appetite for culture and her quick intelligence, Magda invites her into her private world, where elegantly dressed emigres eat salami and drink wine at lunch-time and talk of Tolstoy and Lizst. Over summer, Lisa’s eyes are opened and her suburban home-life cannot escape being viewed through an entirely new prism. What was once her whole world becomes a prison of good-natured small-mindedness and with her newly awakened cosmopolitan consciousness and the dawning of women’s liberation, there is no going back. Beresford has meticulously recreated Sydney in the late 1950s by scrupulously editing existing urban streets and utilising flawless CGI to bring us the Circular Quay trams and the hillsides of brick bungalows. The result is a film that emits a nostalgic technicolour charisma, brilliantly accessorised by production designer Felicity Abbott who has revelled in the clothes of the era with bewitching oomph. Everything sparkles and glows, but the detailed visual facets explored in both the design and cinematography reflect rather than overwhelm the exceptionally drawn facets of character. 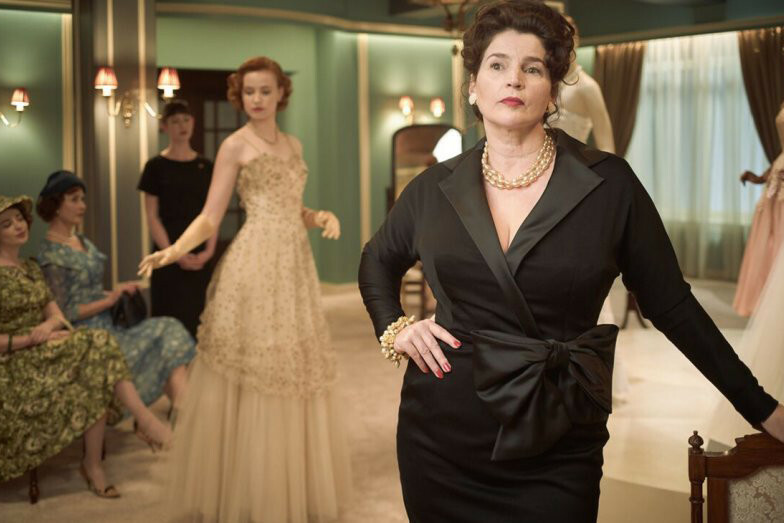 Ladies in Black is intelligent, humane, insightful and funny. The enchanting Angourie Rice (pictured above) gives a perky, spirited performance as Lisa – and this is really her film. But she is matched by a consistently excellent cast, including Rachael Taylor (also above) as Lisa’s beautiful and poignant colleague at the store, looking for a true love who can accommodate her flawed past, and the newly married and deeply disappointed Patty played by the superbly affecting Alison McGirr. Susie Porter is wonderfully tender and funny as Lisa’s mother – a woman who wants for her daughter everything she has been denied. The lovely Julia Ormond (below) – one of those actors who seem to inexplicably disappear for decades once their youth is over – is back with a vivacious performance as Magda, whose wit, ambition and resolve make her an instant candidate for a successful future in Australia, albeit without losing an iota of European savoir-faire. Shane Jacobson (below) is perfect and very funny as Lisa’s father, whose benevolence is compromised by a trepidation about social change, and Noni Hazlehurst as Miss Cartwright, the store supervisor has the best line in the film (and probably the novel) when she tells Lisa: ‘A clever girl is the most wonderful thing in all creation’. The collaboration of Beresford and co-writer Sue Milliken are an argument for making more films with those who have gathered wisdom over long careers and do not need to establish their reputations with the overdone flourishes and exaggerated scripts of less experienced filmmakers. Ladies in Black is superbly written, subtly realised, deeply faithful to the book and the rarest of triumphs: a feel-good movie that is intelligent, humane, insightful and funny. Did anyone else hear some Sound of Music melodies in this film? Ladies in Black is a witty and charming piece of nostalgia, just like some of the better Woody Allen films. And just like those Allen movies, there’s real warmth and compassion for the foibles and shifting values of its characters. A real treat. Simply a continuation of a shafting of the Australia male by contrasting middle class European migrant men with working class Australian men. Not going to look good is it? Add to that an air brushing out of Johnny O’Keefe’s hit by using a female singer (doubt if I ever saw that presented even as a cover). Bland and vindictive. So what’s new? Simple, enjoyable, with refreshing nostalgia. Good film to send your millennials to as a pre-1960s Sydney research project. Trams, dresses, Sydney flats, cars, locations. Cleverly shot around the 21st century. Good ticket out of the tribal contests, gender wars, and the general arm wrestle of life everywhere today. Thanks for the memories Bruce! I saw it last night and I have to say that I think that it’s an excellent film in many ways, and certainly very enjoyable to watch, but it applies the rosiest pair of spectacles to the past that I’ve encountered for a very long time. Relations between the immigrants and the local population were not infrequently difficult. The immigrants were not all cultivated and educated and excellent speakers of English; most of them were in fact very poorly educated and spoke little if any English on arrival. And “difficult” fathers were not always so easily outmanoeuvred and ultimately accepting as Shane Jacobsen. The main reason the movie is so easy to watch is that it presents no real challenges at all. It deserves much praise and a very wide audience for its simple virtues. It’s beautifully shot and lit. All the dialogue is clear. The plot is absolutely clear. The actors are credible and convincing. Everyone lives happily ever after. I’ve already told two lots of people to go and see it. Wonderful casting, wonderful recreation of 1959 Sydney. The script is very true to the novel and captures St John’s wry wit, as well as her concern for the minor acts of kindness or neglect that can change a 16-year-old girl’s life for better or worse. This is one of Beresford’s best. Such a pity that it took decades to get the funding. Yes, but the optimism was somewhat contrived and the gap between Australian and European culture wider than in fact, except for new food, which really did lift a rather boring and “domestic science “ imported English cuisine. Nevertheless a very good if not brilliant movie to watch. Madeleine St John’s sharp observations of Australia in the 1950s were spot on and Beresford’s film does full justice to them. She knew the complexities firsthand, having a French mother and Australian politician father ensnared in a disastrous marriage. Having grown up during the period, I can attest that the gap between Australian and European culture was indeed wide, covering far more than cuisine. The fact that both sides regarded their own culture as superior is superbly caught and StJohn managed to take her own tragic situation and transform elements of it into this witty ‘comedy of manners’ . Excellent casting , great costumes and a wonderful sense of period.